The lights come up. Tumultuous applause. A full house audience undecided only whether to give a standing ovation or not. It’s a moment when most actors can breathe a sigh of relief. 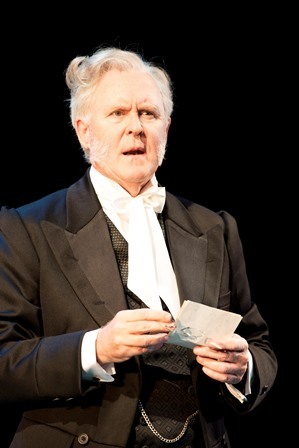 Not John Lithgow, playing the title role in the National Theatre production of The Magistrate, however. No, he has to take a deep breath and belt out a two minute tongue-twisting song that romps through the entire story, if you happen to have missed anything, in the style of Gilbert and Sullivan. There is a part of me that wonders why the National trots out these old Victorian farces, newly polished, to full houses, but they do it so well, one can’t but enjoy it. The staging is superb, with a huge cast, a live orchestra which accompanies the singing chorus, a storybook set which makes full use of the theatre’s technical abilities, beautiful costumes and, of course, first rate acting. John Lithgow is an actor I know better in character roles, but to watch his comic mastery here is a delight. The production is worth it simply to experience his précis of the harrowing night he spent on the run, when he finds his way back to the courtroom, rather worse for wear at the start of Act 3. Over fences, through gardens, down side-streets, one suburb blurs into another as he launches into a soliloquy depicting his agonising attempt to escape the long arm of the law. The audience shares his exhaustion at the end of this little gem. As the hapless magistrate seduced into wicked ways by his stepson, Lithgow does a star turn in a role that in other hands could easily seem dated. In fact, the first time I saw this Arthur Wing Pinero play from 1885 in preview, it all seemed rather stale and a bit pointless, and the singing interludes grated. Since then the pace has tightened and the second time I was able to enjoy the sheer silliness – including the white-faced chorus that pops out between each scene to deliver a finger-wagging platitude. When the widow Agatha Farringdon weds that pillar of society, Aeneas Posket, magistrate for the Mulbery Street Police Court, she fails to reveal her real age, setting in motion a series of misunderstandings that lead to a merry romp around London. Her 19-year old son Cis, believed to be a mere 14, seems very precocious for his years, and when his mother disappears one night, frantically trying to muzzle the child’s godfather, the boy decides to teach his very proper new dad what fun looks like. A police raid on the sleazy hotel where both parties find themselves has compromising consequences. The inevitable tangle leaves the newlyweds shocked at each other’s misbehaviour. It’s the marital strife that forms the basis of many a farce but despite its age, the discomfort suffered by the genial man of law still has the ability to engage. There is even a banker joke, to bring the writing bang up to date! Nancy Carroll as the deceiving wife Agatha is a strong foil for Lithgow, but unfortunately often altogether too histrionic and her shrill tone jars at times. Her son Cis is played with an upstanding ginger coif and an appealing charm by Joshua McGuire, and as Lithgow towers over him, as he does over the whole cast, the possibility of Agatha’s lie is made apparent. The rest of the strong cast include Jonathan Coy as the godfather, an army man who finds himself embroiled unwillingly in this affair, Christina Cole as the blonde sister thwarted in love and Roger Sloman in a wonderful cameo as Mr Posket’s second in command, who is appalled at the mess his superior seems to be making of things. Timothy Sheader’s slick direction combines with Katrina Lindsay’s frilly pop-up book set to make this a happy bit of froth which succeeds admirably in chasing away the wintry blues.